Steve Kirby has been appointed as Derbyshire County Cricket Club’s new assistant and bowling coach. The 41-year-old former fast bowler, who claimed 797 wickets during a 12-year professional career, joins the club from his role as head coach of the MCC. Kirby will work with Derbyshire’s head of cricket David Houghton and head of development Mal Loye across all levels of cricket at the county, including the development pathway. The former Yorkshire, Gloucestershire and Somerset paceman made 167 first-class appearances during his playing career, taking 572 wickets at an average of 28.74. In total, he featured in 348 matches, claiming 18 five-wicket hauls and best figures of 8-80. Following his retirement from playing the game, Kirby was appointed MCC head coach in 2016 and was responsible for overseeing all aspects of their coaching structures, including the MCC Young Cricketers, the MCC Academy based at Lord’s and community coaching programmes. 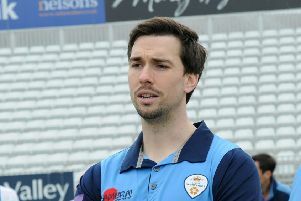 Houghton said: “We’re lucky to attract a coach of Steve’s quality and experience to Derbyshire. He is highly regarded and has done a lot of good work during his time as head coach at the MCC. Kirby added: “I’ve thoroughly enjoyed my time with the MCC and learned a huge amount. I’m grateful for the opportunity they gave me. “I’ve met some amazing people and made some great friends. I was able to work with some incredibly talented players and I wish everybody at the MCC all the very best for the future.